Tokyo Nights May Soon Be Lit Up by a Country 1,700 Miles Away ~ ULEMJ Damiran, Ph.D. The lights of the high-end boutiques and bars of Tokyo’s Ginza neighborhood may someday be powered by coal burned more than 1,700 miles away (2,700 kilometers) in Mongolia, electricity zipping over ultra-high voltage lines across deserts and under seas. That’s the idea behind plans in Asia for so-called super grids, sending power from countries with relatively few people but lots of wind, sun and fossil fuels to distant electricity-hungry population centers trying to keep up with demand. Mongolia, desperate to make more of its abundant resources as it seeks to revive its flailing economy, aims to make that vision a reality through one of the world’s most ambitious power projects. The landlocked nation is considering a $7 billion plan to build coal, wind and solar plants that could send electricity across China, Russia, South Korea and Japan, according to Tamir Batsaikhan, a project director with the Shivee Energy Complex. It’s just one concept of how to connect power markets across Asia, where demand is forecast by BMI Research to grow 3.5 percent annually through 2026. While the region’s biggest economies, led by China, throw their support behind the projects, the challenge of moving electricity from one country to another --- from the differences in voltages and price to worries about relying on neighbors for power -- may mean Mongolia’s vision remains just a dream. A feasibility study on Mongolia’s proposed 5,280-megawatt Shivee project, which is backed by state-run investor Erdenes Mongol LLC and the country’s energy ministry, is expected by the end of this month, said Tamir. State Grid Corp. of China is carrying out the study and talks with potential buyers would only start after its completion, he said. State Grid, one of the world’s biggest power distributors, and Japan’s SoftBank Group Corp., as well as partners in South Korea and Russia, are a few of the main drivers behind the latest ideas to develop a power grid spanning northeast Asia. State Grid’s former chairman, Liu Zhenya, floated an even grander plan almost two years ago for a global network to transmit electricity from continent to continent by 2050 at a cost of $50 trillion. While Liu has moved on to GEIDCO, where SoftBank’s chief Masayoshi Son is vice-chairman, State Grid continues to promote super grid proposals. The company’s chief engineer, Zhang Qiping, said in November that China can export surplus power to India and Southeast Asia. A global network also dovetails with China’s One Belt, One Road program, President Xi Jinping’s cornerstone trade initiative to connect Europe, Asia and Africa through infrastructure and investment. 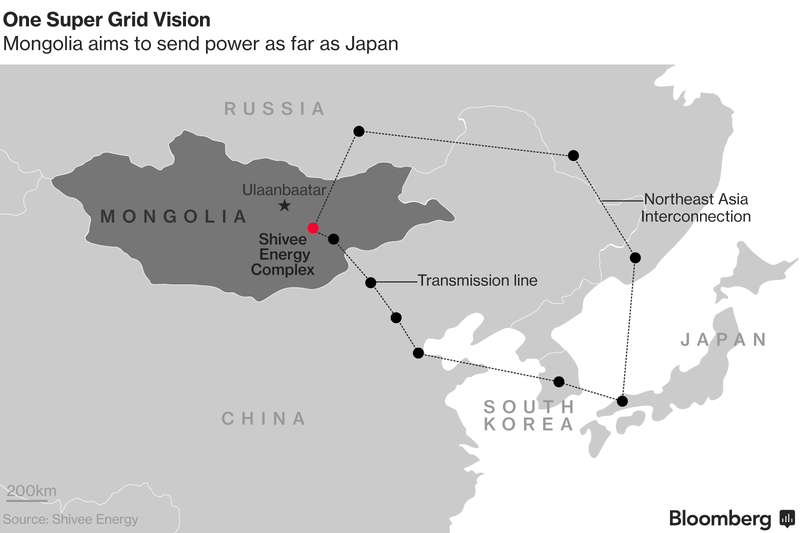 While State Grid has built 10 transnational power transmission lines that include links to Russia, Mongolia and Kyrgyzstan, those interconnects are less about transmitting large amounts of power and more about stabilizing the network, according to UBS’ Powell. State Grid didn’t reply to emails seeking comment, while Korea Electric Power Co. declined to comment. Russia’s Rosseti PJSC is in discussions with partners from China, South Korea and Japan about “establishing bilateral energy ties and developing major Asian energy ring,” said Konstantin Petukhov, deputy director general for development. The company is also in talks with the Mongolian government about building a new power grid, which could be linked internationally, he said. “SoftBank places importance on renewable energy, and a super grid that extends from Mongolia to Japan fixes the problem of security of supply, as the sun is always shining and the wind is always blowing somewhere,” Spokesman Kenichi Yuasa said by email, adding that the company isn’t involved in the Shivee Energy Complex. Such a network faces multiple obstacles, including the challenge of linking different grids and infrastructure and deciding how the power would be priced, according to analysts at UBS and Wood Mackenzie Ltd. Some countries may also worry about becoming too reliant on imported power or technology from China, which has faced resistance in Australia and the U.K. over investments in their electricity infrastructure. “Countries may become cautious about taking Chinese technology, worrying this could endanger their own power system security or even national security,” said Frank Yu, principal consultant on China and North East Asia power at Wood Mackenzie. GEIDCO’s chief Liu has voiced support for moving electricity from Mongolia and northeast China to Japan and South Korea, according to a January statement sent by the organization in response to a request for comment. Other potential transmission projects cited by GEIDCO include sending hydropower from China’s Yunnan province and thermal power from the country’s north to Thailand, Myanmar, Vietnam and Bangladesh; hydropower from Tibet to India and Bangladesh; coal, wind and solar power from western China’s Xinjiang region and coal-fired electricity from Kazakhstan to Pakistan. While these projects help China solidify its relationships with neighbors, as well as other Belt and Road countries, the Shivee project in Mongolia is one way to aid an economy that’s forecast by the World Bank to contract 0.2 percent this year. Constructing Shivee would create 25,000 jobs over five years and may increase gross domestic product by 4 percentage points annually during that period, according to an August GEIDCO statement. “With abundant resources of cheap energy coal, which is not so much profitable to transport, it makes sense to export the final product, electricity,’’ said Khashchuluun Chuluundorj, an economist at the National University of Mongolia.